The SRS airbag module is often referred to as the airbag computer , 591, derm unit, airbag sensor as well as the diagnostic unit. In most situations once the airbags or seatbelts have deployed you will need to replace it with a new module from a dealer (costly) or a recycled airbag module from a salvage yard (good luck with that.) However, with our crash data removal service you have a new more affordable and reliable option. Buying a new srs airbag module at the dealer is an expensive option, not to mention the additional labor charges for installation and programming. An srs airbag module purchased from salvage yards often contain crash codes and are ineffective without additional intervention by a scan tool or technician and in most cases won't work on your car. By resetting the vehicle's original SRS airbag module, auto repair shops across the country count on our crash data removal services to lower the cost of rebuilding vehicles. During the reset process we simply read and clear any airbag codes present in the air bag diagnostic computer. All other data is left intact, therefore, in most cases an additional trip to your auto dealer can be avoided. Send us your airbag computer by mail with your Name, Phone Number as well as the year, make and model of your vehicle. Write this information on a piece of paper or on your business card and tape it to the module. Once, we receive your computer we will contact you to complete your information and payment details by telephone. The module will then be processed for crash data removal and sent back to you. The turnaround time is one to two business days. This service is designed for vehicles that are known to be involved in an accident. 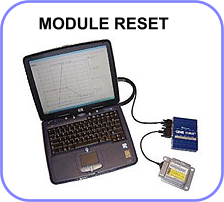 Most modules, 2003 and up, can be cleared by our process, however, due to the nature of the accident it is possible that your module may have undetectable internal issues (electronic defects) Therefore, regardless of our service your module will never work again. However, since we only work with the module's EEprom or Microcontroller, we are still able to complete our work regardless of these defects. A small number of airbag modules, 2-3 percent of modules we receive have undetectable electronic issues. If your module is determined to have internal electronic failure you will be eligible for a partial refund of our service fee. To remove the crash data from your module our service fee is $95.00. Volume discounts are available depending on quantity and or monthly commitment. If you would like to remove the crash data and recycle your module. Mail them in or contact us for additional information. You can also fill out the form at the bottom of this page to prepay for your service. "Prepaid orders will receive priority service and therefore receive faster turnaround times"
Discount valid four days from quote date.
. Can not be combined with any other discount. Can not be applied on orders where only a service is purchased.